Trump extended his personal thanks to Adelson on Saturday in a speech to the Republican Jewish Coalition in Las Vegas. 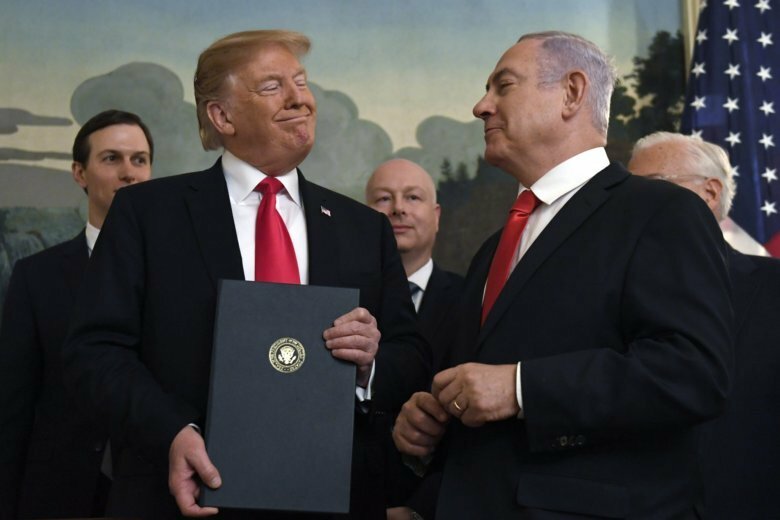 The president also boasted extensively about his Israel-related policy moves. “Unlike other presidents, I keep my promises,” he said, referring to the embassy relocation. Divisions among U.S. Jews have been exacerbated by recent allegations of anti-Semitism directed at the Democrats’ two Muslim congresswomen — Ilhan Omar and Rashida Tlaib. Seizing on the controversy, Trump tweeted his support for a purported “Jexodus” movement that would encourage Jews to leave the Democratic Party. Netanyahu’s main challenger in the election is popular in Israel but has a relatively low profile in the United States. American Jews who dislike Netanyahu view Gantz as preferable, due in part to a less combative personality, but liberals note with frustration that the platform of Gantz’s Blue and White party makes no mention of Palestinian statehood, and says that Israel will maintain control of parts of the West Bank.